On the first floor, without a lift, of a historic building (one of the most ancient in the area), the Campo de’ Fiori Apartament transmits a sensation of pleasure and quietude due to its warm and pleasant atmosphere, and to the quiet zone where it is located. The entrance leads straight into the romantic living room, which has a comfortable double sofa bed suitable for an extra person, LCD TV, Stereo System, Ipod dock station, books and DVDs, an elegant wooden dining table and a huge window that overlooks a courtyard. The very high, wooden ceiling is splendid and there is an original Renaissance decoration on the wall.The night area is reachable through the stylish ironwork staircase and has a queen size bed and a chest of drawers for your clothes. The apartment is equipped with linen and towels and they are changed weekly . The kitchen is separate from the living area; it is modern and fully equipped with everything you need during your stay, making cooking a pleasure whenever you choose to cook some of the wonderful fresh vegetables bought at the local outdoor market. Furnished in a very soft and functional way, this apartment also boasts a very efficient independent Heating System/ Air Conditioning which ensures the guests’ comfort all the time. Nowadays "Campo de' Fiori" represents one of the places where Rome shows its most authentic character from the early morning with its fabulous open air market, to the deepest night with entertainment offered by numerous bars, restaurants and "trattorie" of the area. “Yet another fabulous place to pull up a chair, order an espresso or a glass of wine and do some serious people watching. From here you should wander around the wonderful tiny cobblestone streets of the local neighbourhood - it's the perfect area to get lost in and make your own Rome discoveries as you are truly in the pulsing heart of the city”. Location was ideal for what we had planned to do in the city. Would definitely stay there again! Thanks a lot for your kind review! It was a pleasure having you in my apartment and I'm looking forward to having you again. The apartment is in a beautiful old building located in the historical district. Within easy reach of the major tourist attractions. We walked everywhere from here. The apartment is small but ideal for us - lovely and clean too. It is up one flight of stairs, no lift, and the stairs up to the mezzanine could present a problem if you're not too steady. However the benefits of the location far outweighed this. It is within striking distance of Campo di Fiori which is a lovely square to people watch with plenty of restaurants to choose from. Tiny criss cross cobbled streets with artisan shops lie behind the piazza. I would wholeheartedly recommend this apartment. Francesca was easy to contact and gave some useful tips for exploring the area. Karen,Thank you so much for your kind words. We really appreciate you taking the time out to share your experience with us and I’m glad you had a great stay! We look forward to having you again in the future! Best Regards, Francesca Unica Property Management Group. I stayed for two weeks and felt like a native Roman. Everything I needed was within 2 minutes of my door — supermarket, restaurant, wine bar, coffee shop, bus stop. In fact, I walked all over the city and mainly ignored public transportation. I cooked simple meals in the kitchen and felt completely at home. Francesca was available online to answer any questions. Marie, Thank you very much for your time in writing this review. Much appreciated! I'm glad you enjoyed your stay in the apartment and its amazing position and, you are right, when you live two week there, you feel like a native Roman. Came back whenever you can , we cannot wait to have you again! This is a wonderful loft in a great. Walkable to everything from the Vatican to the coliseum. Lots of great places to eat close by. We were very lucky to find this well-equipped apartment (fun layout with an historic overlay), great location (food, wine and art just steps away) and Francesca, a thoughtful and helpful owner. We stepped out our front door into the heart of old Rome. Just beyond the nearby Palazzo Borghese (now the French embassy) was the Campo de'Fiori, one of the best and livliest markets in the city. And just beyond this was Piazza Navona with Bernini sculpture and Borromini architecture. We had easy access to St. Peter's and the Vatican from a convenient bus stop at Chiesa Nuova (where there is also a taxi stand). The gem Castel Sant'Angelo, one of our favorite visits, is very close, too. 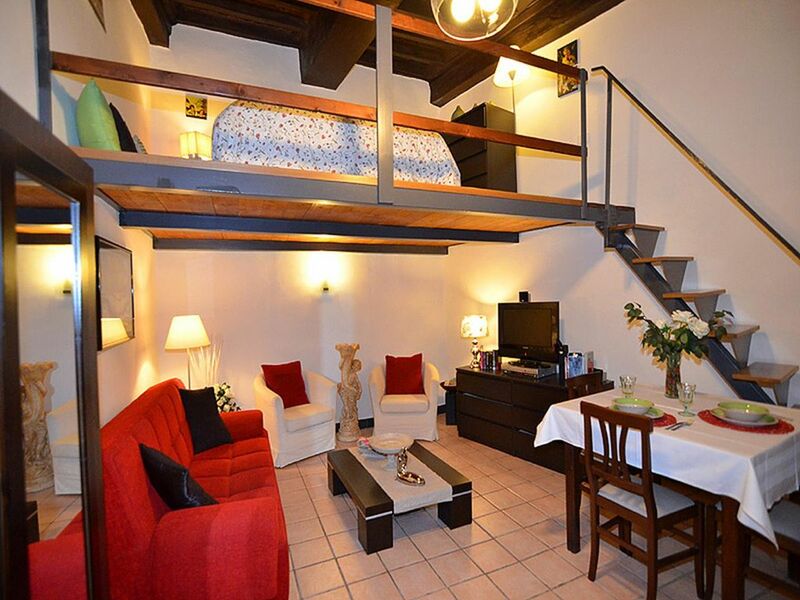 We highly recommend this apartment and would happily stay here again if we have an opportunity to return to Rome. Thanks for the awesome review, John! We work hard to meet expectations like yours, and we’re happy to hear we hit the mark for you.